This tutorial will introduce how to increase the size of C drive which is running on low disk space in Windows 2008 VMware. Download IM-Magic Partition Resizer Server to resolve C drive low disk space problem on Windows Server 2008 VMware. As the administrator of your PC, have you ever met the problem that C drive needs to be expanded? If you need to extend C drive in Windows Server 2008, IM-Magic Partition Resizer Server can help you resize disk partition on all Windows Servers without touching original data. This partition software works perfectly in VMware to reallocate disk space when C drive is running on low disk space. By using this partition software, you can extend partition, shrink partition and move partition. It supports C drive system partition and data partition resizing. "I have Windows Server 2008 running under VMware and now the C drive is running out of disk space. I want to extend the size of C drive but Windows 2008 has the Extend Volume greyed out under Disk Management. Can you tell me if there is any other method to resize C drive on Windows Server 2008 VMware?" "I have a 160GB Seagate hard disk which divided into two partitions in Windows Server 2008 VMware. The C partition which works as system partition is nearly full now, but the D partition which is used to storage data still has much free space. 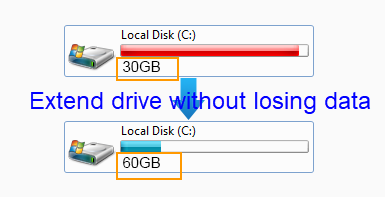 So I want to move some free space from D drive to C drive. Now, I want to know if it is possible to resize C drive without reinstalling Windows Server 2008." How to Resize C Drive in VMware Windows 2008? There are three methods at least to resize C drive on Windows Server 2008 VMware, but the most effective and efficient way is to rely on third-party partition software. 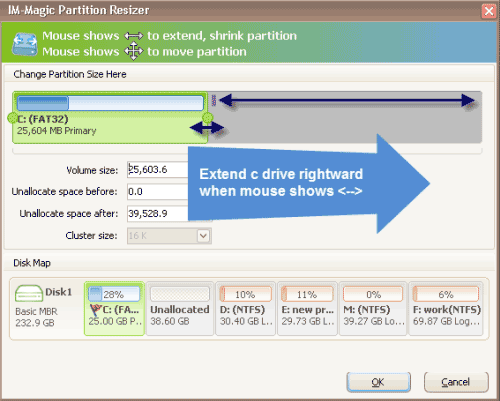 IM-Magic Partition Resizer Server is such a partition tool, which can work in Windows Server 2008 VMware. With Windows built-in partition tool Disk Management or Diskpart command, you may need to reinstall operating system and delete data to resize C drive. However, with the professional partition software, you can get C drive system partition expanded without any influence on the operating system or disk data. This partition software allows you to resize C drive without rebooting your computer or repartitioning hard disk no matter it is NTFS or FAT32 file system. With this partition software, you are also able to resolve problem about how to extend Windows boot volume in Windows 2003 VMware, expand system partition on Windows 2012 VMware and increase size of C drive on Windows Server R2 VMware, etc. Windows Server 2008 has built-in disk management tool, so you can extend C drive without any partition software when running into low disk space problem. You can resize C drive with help of Disk Management or Diskpart command. Both of them are Windows built-in tool, with which you can resize hard disk on Windows Server 2008 VMware. However, both of them have some limitation, so you may find that you are unable to resize hard disk by using either of them. If so, you still need to rely on third-party partition software. You can open Disk Management to resize C drive on Windows 2008, which is easy to handle. However, Disk Management has its limitation that requires adjacent unallocated space beside the C drive. You can shrink disk partition that has much free space to create some unallocated space under Disk Management, but you cannot move the unallocated space close to C drive unless you can delete the partition between the C drive and the unallocated volume. Compared with Disk Management, Diskpart to extend C drive is much more difficult and has more limitations. First of all, adjacent unallocated space is needed in order to extend C drive by using Diskpart command. What is more, Diskpart cannot extend a system partition. Therefore, if C drive is system partition, Windows will pop up message to say the selected drive cannot be extended. In addition, Diskpart command cannot extend FAT32 partition.